Home Weight Loss What Can You Eat on a Keto Diet to Lose Weight? The ketogenic diet can help you lose weight quickly and improve certain health conditions. So, what can you eat on a keto diet? The ketogenic diet, or keto diet, can help you lose weight quickly and improve certain conditions such as fatigue, diabetes, and certain metabolic syndrome risk factors. 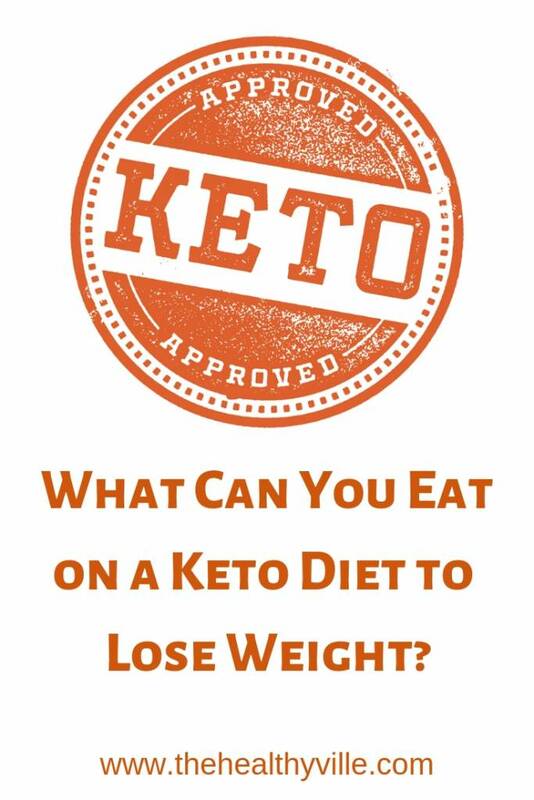 This diet is based on eating ketogenic foods, which contain very low amounts of carbohydrates. In the absence of sugar from food, the body begins to break down stored fat into molecules called ketone bodies. This process is called ketosis. So, what can you eat on a keto diet actually? Unprocessed meats are low in carbohydrates and are one of the basic ingredients of the ketogenic diet. Fresh meat has B vitamins, minerals such as potassium and zinc, creatine, taurine, carnosine. In addition, meat is an excellent source of selenium that has a powerful antioxidant function and is linked to a reduction in inflammatory diseases. Keep in mind that processed meats, such as sausages, sausages and meatballs, often contain added carbohydrates. Try to include a cut of meat at least once a day. To maintain its properties as one of the ketogenic foods, remember to cook it with the minimum amount of oil and accompanied by enough vegetables. The second of the ketogenic foods are eggs. A large egg contains less than 1 gram of carbohydrates and less than 6 grams of protein, which makes it a healthy food suitable for a ketogenic diet. Despite its bad reputation, consuming the yolk can be highly beneficial, since there are concentrated some vitamins (A, B9, B12, D, E and K) and essential minerals such as iron. In addition, egg consumption can alleviate the symptoms of the metabolic syndrome by improving insulin resistance. Olives are another ketogenic food since they only contain 0.2 grams of carbohydrates per unit. In addition, the carbohydrates in olives are in the form of fiber. The olives provide vitamin E, iron, copper and calcium. They are also rich in antioxidants that can help reduce oxidative damage in the body and fight infections. In addition, olives help regulate cholesterol and reduce blood pressure. One clove of garlic contains only 0.99 grams of net carbohydrates. Garlic, and other vegetables from the Allium family, contain allicin. This is a plant compound that has anti-inflammatory and antioxidant properties, so it protects against brain damage and disease. Garlic is also considered an excellent source of vitamin B6, as well as manganese, selenium and vitamin C.
Whenever you can, add a little garlic to your dishes. Its characteristic flavor can highlight dishes in a very simple way and without adding more exotic spices. With the low carbohydrate content that the ketogenic diet requires, it is essential to ensure that enough fiber is being obtained. A portion of 100 grams of bitter chocolate, containing between 70% and 85% of cocoa, provides 11 grams of fiber. The antioxidants and fiber present in dark chocolate can help with digestion. In addition, cocoa contains flavonoids that dilate blood vessels to improve blood flow, lower blood pressure and increase good cholesterol. Dark chocolate is also rich in manganese, copper, iron and magnesium. When buying chocolate or any cocoa product, you should pay attention to the label. Choose those chocolates that do not contain added sugars and that have a minimum amount of carbohydrates per serving. Almonds are another ketogenic food, because 100 grams of almonds have only 7 grams of net carbohydrates. In addition, they are really satiating so by eating a small portion helps to fight the appetite of mid-morning. Almonds also provide vitamin E, copper and riboflavin. All these elements help the production of energy. Its consumption also provides magnesium and potassium, two important electrolytes that must be replaced in a ketogenic diet. While almonds are great to include in your diet, it is convenient to limit the portions to about 20 grams per day to avoid rises in glucose. Avocado or avocado have only 2 net carbohydrates per 100 grams of pulp. They are rich in healthy fats and are full of nutrients, which makes them one of the most beneficial ketogenic foods. Avocados contain fiber, copper, folic acid and potassium. They also contain important vitamins such as K, E, C and B. If you do not like avocados, you can try to consume them in the form of oil. Although you will not get the same amount of vitamins and minerals, its oil contains mainly monounsaturated fats. This unsaturated fatty acid helps improve cholesterol levels and can be used for cooking. You can use the previous ketogenic foods as a guide to help you create your own dietary plan, adapted to your tastes and needs. Remember to accompany the keto diet with large amounts of water. As always, we recommend consulting with a nutritionist to ensure you receive all the nutrients your body needs. Don’t forget to SHARE what can you eat on a keto diet with your friends and family on your social networks!